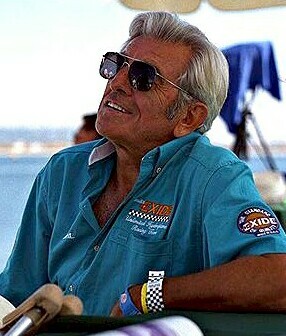 Hydroplane racing legend Mira Slovak passed away Monday June 16 at his home in Fallbrook, California. He had been suffering from stomach cancer. He was 84. Beyond doubt, one of the most colorful characters ever to jockey an unlimited hydroplane was Mira Slovak, “The Flying Czech,” who was to boat racing what Errol Flynn was to the movies. During an unlimited career that lasted from 1956 to 1968, Miraslav J. Slovak was a competitive presence on the race course. He was national high point champion twice–in 1958 with Miss Bardahl and in 1966 with Tahoe Miss. And he won the 1966 APBA Gold Cup with Tahoe Miss. When Mira arrived on the hydroplane scene in the middle 1950s, promoters of the sport were faced with a peculiar problem. Instead of having to invent an interesting background for a new participant, they had to present Slovak in a credible light. No APBA publicist–or Hollywood screenwriter–could have concocted a fictional script to match what Mira had actually done in the few years prior to his celebrated debut at the 1956 Seattle Seafair Regatta as rookie driver of Bill Boeing, Jr.’s Miss Wahoo. Born in Czechoslovakia in 1929, Slovak found himself, after World War II, behind the Iron Curtain of Communist oppression. Mira longed for the freedom that was to be found in the West but which was denied to him and his fellow Czechs. From an early age, Slovak had a passion for flying and prepared himself for a career in aviation. During the war, he would watch the American B-17 bombers fly overhead. Coincidentally, those same B-17s were built by the Seattle-based Boeing Company, founded by Bill Boeing, Sr. While still in his early 20s, Mira progressed to the rank of captain and chief pilot for the government-controlled Czechoslovakian Airlines. On a regularly scheduled flight from Prague to Brno in 1953, Slovak made his bid for freedom. He overpowered his Communist co-pilot, locked the cabin door, and tipped the plane downward in a steep dive to well under 1000 feet, which was below the effective radar screen. Mira flew instead to Frankfurt, West Germany, where he surrendered the aircraft and requested political asylum, together with five of his passengers. The 45-minute hedge-hopping flight to Frankfurt was fraught with peril. At any moment, Slovak expected Soviet MIG fighter planes to blast him out of the sky. This was at a time when Cold War tensions were at their peak. News of the daring escape was flashed around the world. The name “Mira Slovak” was suddenly on everyone’s lips. An international celebrity, he was interviewed on Voice of America and, for over a year, worked closely with the U.S. Air Force in Germany and in Washington, D.C. Upon arrival in the United States, Mira had difficulty finding employment. As a non-citizen, he could not be issued a radio operator’s license, which was necessary to fly a plane. This problem was solved by President Dwight D. Eisenhower, who signed an executive order that allowed Slovak to be issued a license. In the years that followed, Mira had a special desire to win the President’s Cup race in Washington, D.C. In those days, the cup was traditionally presented by the nation’s Chief Executive. Slovak eventually got his wish when he won the race in 1959 and thus earned the opportunity to thank Eisenhower in person. Mira’s arrival on the thunderboat scene was a classic case of the right man being in the right place at the right time. After working as a cropduster in Eastern Washington, Slovak moved to Seattle when he was hired as Bill Boeing, Jr.’s personal pilot. Hydro fever was at its peak in Seattle during the 1950s, and Boeing decided to climb on the unlimited bandwagon with a rig of his own, the Miss Wahoo, named after Mrs. Boeing’s home town of Wahoo, Nebraska. Mira was given an opportunity to test drive the boat. After some coaching by veteran designer and former driver Ted Jones, Slovak was ready to make his competitive debut at the wheel of the Allison-powered craft. The Seafair Regatta on August 5, 1956, was billed as a “National Championship Race” for unlimiteds. Mira not only drove his first race at the 1956 Seafair but he SAW his first race as well. But his unfamiliarity with the sport didn’t prevent him from starting in the inside lane and finishing second to overall winners Russ Schleeh and Shanty I in Slovak’s first competitive heat. When all was said and done on that historic August 5, there could be no doubt that “The Flying Czech” was no “Fly By Night” operator. Clearly, this guy would be heard from in the years ahead. And he was. His first race victory came at the 1957 Lake Tahoe Mapes Trophy with Miss Wahoo. Mira also claimed the 1959 President’s Cup and the 1959 Lake Mead Cup for the Boeing team. He was profiled on the old This is Your Life television program. And despite his imperfect English, Slovak found himself a repeated guest on the radio talk show circuit in the Pacific Northwest and throughout the country. While the Wahoo was out of action during the 1958 season, Mira won the Buffalo Launch Club Regatta and the American Speedboat Championship Race (in Washington, D.C.) with Ole Bardahl’s Miss Bardahl. In addition to his stints with the Wahoo and Bardahl teams, “The Poor Refugee” saw brief action with the Miss Burien in 1958 and the Miss Pay ‘n Save in 1959. He also drove many races in the 280 Cubic Inch Class Wee Wahoo, one of the better limited hydroplanes of that era, designed by Ron Jones. One of Mira’s frequent rivals on the 280 Class circuit was the future unlimited luminary Billy Schumacher, driver of Dough Baby. Slovak was possessed with a wicked sense of humor. In 1959, when the new Miss Thriftway took its maiden voyage on Seattle’s Lake Washington, driver Bill Muncey wanted to make a big splash in front of the local news media. But Mira “upstaged” Bill by flying around just above Miss Thriftway with Slovak’s Bucher-Jungman biplane while Muncey was making his highly publicized run. That same year, when Muncey’s wife Kit was expecting a child, Bill attached a pink scarf to the back of his crash helmet in the hope of having a girl. Mira jokingly attached a black sock to HIS helmet in the hope that the infant would be of the opposite gender. Sure enough, the Munceys had a boy, and “Uncle Mira” hasn’t lived it down yet! Slovak experienced a lot of good times during his career. But there were “down” times as well. The Wahoo barrel-rolled during the 1960 Seafair Regatta and put Mira in the hospital. But Slovak was back on his feet and back out on the race course before the end of the season. Then, in 1963, the new Miss Exide, owned by Milo and Glen Stoen, disintegrated at the Diamond Cup in Coeur d’Alene, Idaho, while Mira was battling for the lead with Muncey and the Miss Thriftway. After two major accidents in the space of three years, an ordinary man might have called it quits and rested on his laurels rather than tempt fate again. But “The Flying Czech” was no ordinary man. After being inactive in power boat racing since the Exide crash, Slovak had to re-qualify as a driver in 1966. But it didn’t take long for the former freedom flyer, who was now a U.S. citizen, to regain his competitive edge. Mira and the Tahoe Miss thundered to victory in the Gold Cup at Detroit, the British Columbia Cup at Kelowna, the Diamond Cup at Coeur d’Alene, and the Indiana Governor’s Cup at Madison. He did this with an Allison engine at a time when most of the top unlimiteds were using the more-powerful Rolls-Royce Merlin. And in addition to driving in competition, Slovak would often take to the sky and stage aerobatic shows with his biplane between heats of the races. Despite having been absent from the unlimited hydroplane scene for several years, Slovak was still as popular as ever with the fans. Everyone wanted his autograph. He was sought after for press, radio, and television interviews. He was even linked romantically at this time with movie actress Susan Oliver, who shared Mira’s keen interest in flying. He was also active in air racing and won many championships. Aside from a few relief driving appearances the following year with the underpowered Miss Chrysler Crew, the 1966 campaign proved to be Slovak’s last hurrah as a boat racer. Mira suffered serious injuries in a plane crash during the Spring of 1968 and bade the thunderboat sport goodbye. He chose to concentrate instead on his career as a commercial pilot for Continental Airlines. A member of the Unlimited Hydroplane Hall of Fame since 1963, Slovak is remembered as being one of the better of the best during those halcyon days of the sport. He is mentioned in the same breath with the likes of Muncey, Schleeh, Bill Stead, Jack Regas, Ron Musson, Bill Cantrell, and other greats of that era.